Sprouting grain for livestock is simple and easy, requiring only a little room, time and patience. Many grains cannot be fed whole to livestock as their bodies can't utilize the nutrients contained inside. There are two ways to overcome this - feeding the grains crushed/cracked or sprouted. Our preference is to feed them sprouted as it not only makes them more digestible, it increases the nutritional value. I find feeding sprouted grain to the poultry is also more economical. In Isabell Shipard's book How Can I Grow And Use Sprouts As Living Food?, she states "The protein content increases by 300% in the third day of sprouting, compared to the unsprouted wheat seed." This increased protein has been very valuable to our milking cow. We give Missy a small amount of sprouted grain in her chaff mix, which she receives daily whilst being milked. The sprouts have helped increase her lactation and made it easier for her to keep weight on, which anyone who owns a dairy breed will tell you can be quite tricky. So, just how do you sprout grain for livestock? - Sieves to drain the sprouts into. Choose a sieve with holes smaller than your chosen grain. For larger grains like wheat and barley, we find plastic pasta strainers work well. You can find these cheaply at shops like BigW, The Reject Shop and Overflow. For tiny seeds like millet a fine mesh sieve is required; supermarkets are the best place to find these. -Decide how much grain you need to soak. Remember that once grain is soaked and sprouted it has to be used up within a certain amount of time or it will go mouldy. Feeding mouldy grain to livestock is a danger to their health and could cause botulism, which can be fatal. Only feed grains that are clean and mould-free, and do not smell sour. For instance, if you have a backyard flock of 3 laying hens, soaking 5 kilos of wheat all at once isn't a good idea, as the sprouts will grow mould before they'll eat through it. A better option is to put a small amount of grain on to soak daily, so that you will have a continuous supply of sprouts ready to feed at the optimum sprouting level. -Put the grain into a bucket and cover with water. Leave about 1cm of water above the sprouts as they'll soak this up. Leave to soak for 12 hours or overnight. The next day drain into a sieve and rinse thoroughly with clean water. Place on a rack or hang the sieve up, somewhere out of direct sunlight but with plenty of airflow. Thoroughly rinse the grain daily. Depending on the weather, you should start seeing small white 'tails' sprouting in a couple of days. The grain can be fed at any time from this stage, or you can let it sprout for another day or two for further sprouting, it's entirely up to you. Pigs love their sprouts well done - that is with both the "tails" shooting, and the pale green shoot appearing at the top of the sprout. A basic rule of thumb for pigs is, the more sprouted it is, the more they like it and the better it is for them. Chickens prefer theirs within 2-5 days of sprouting, and the cattle and sheep are pretty much the same. 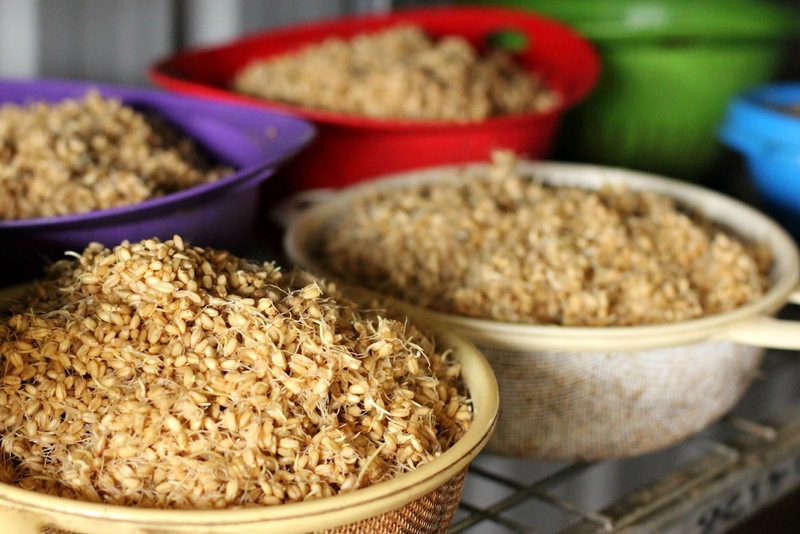 If you want the grain to sprout more quickly, put the sieve of grain into a box or lidded bucket each evening. In the morning take it out and follow the usual rinse and drain routine. Sprouting grain generates a lot of warmth overnight when boxed, and this speeds up the sprouting process. We learnt this through necessity of having to store the grain away safely every night to keep it safe from vermin. And that's all there is to it. Whether you're like us and caring for a large menagerie, or only feeding a small flock of laying hens, there's really no reason not to include even a small amount of sprouts in your animal's diets. They'll love you for it. I think growing the grain in a bucket would be more likely to cause it to go mouldy. When you put a small amount of soaked grain into the sieve it has a lot of room to breath. Our climate is subtropical and the grain doesn't go mouldy. Rinse it daily, keep it out of direct sunlight and in a spot where the air can flow throw....i.e on a shelf, hanging from a hook, ect. Just don't put it into a lidded bucket or cupboard as it will definitely go mouldy then. If you over soak the grain it will go mouldy rather than sprouting. As I said in the article, soak it for a maximum of 12 hours. i.e put it on to soak in the morning, drain it that night or put it on to soak in the evening and drain it the following morning. Any longer than that, especially in hot weather, and the grain will be ruined.